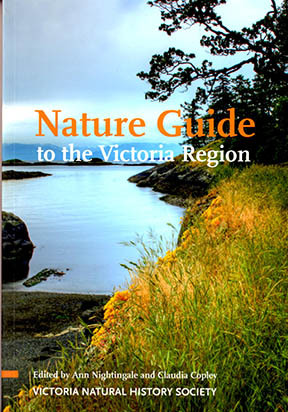 The Nature Guide to the Victoria Region is available at the Royal BC Museum, bookstores and at VNHS presentation nights. The Victoria region is a natural wonderland — one of the most biologically rich areas of the country, with many plants and animals found nowhere else in Canada. Whether you’re a beginner or a seasoned naturalist, a visitor or a resident, this book will give you the knowledge you need to get the most out of your explorations of southeastern Vancouver Island. Ten local experts have contributed their knowledge about all things natural in this region, from mushrooms and dragonflies to owls and whales. In ten chapters, they describe the species most likely to be seen here, and direct you to the best places to see them. Nature Guide to the Victoria Region is designed to help you understand the variety of habitats and natural wonders awaiting your discovery, all in a portable, easy-to-read format. It includes beautiful full-colour photographs, checklists and a map of all the great places to visit. Ann Nightingale is co-president of the Rocky Point Bird Observatory and Claudia Copley is the entomology collections manager at the Royal BC Museum. They and the other contributors to this book actively support the Victoria Natural History Society. Thanks to everyone who contributed.